AP POLYCET 2019: State Board of Technical Education and Training, Andhra Pradesh, Hyderabad has decided to conduct AP POLYCET 2019 in last week of April 2019. AP POLYCET Registration process will be commenced in 4th week of March 2019. Students who want to get admission in diploma courses have to fulfill all Andhra Pradesh SBTET Eligibility conditions. Interested candidates can apply by submitting their AP POLYCET Application form before 2nd week of April 2019. Complete details of AP POLYCET 2019, has been furnished below by the team of www.privatejobshub.in you can go ahead and grab all latest updates of Andhra Pradesh POLYCET 2019. Nationality: Student must be an Indian citizen. Qualification Criteria For AP Polycet 2018: Applicants must have completed SSC exam conducted by the State Board of Secondary Education, Andhra Pradesh/ Telangana. Those belonging to NIOS/CBSE/ICSE/ or equivalent exam recognized as equivalent to SSC by A.P. govt must passed all subjects including Mathematics, Physics, and Chemistry with minimum 35% marks in each subject. Domicile: Contenders should have domicile of Andhra Pradesh state. The student must qualify the qualifying exam from the schools of Andhra Pradesh. Age Criteria: There is no age limit for appearing in Andhra Pradesh Polytechnic Common Entrance Test 2018. Contenders who are going to appear in Andhra Pradesh Polytechnic Common Entrance Test 2018 they need to pay application fee of Rs 350/- as an application fee which can be paid through online/Meeseva/payment gateway/net banking/Help line centers (Polytechnics). Candidates will get admission in various engineering and non engineering diploma courses on the basis of their marks obtained in Andhra Pradesh polytechnic common entrance test. Further qualified candidates in SBTET POLYCET Entrance Test will be called for AP Polycet Counselling and document verification for final admission in applied programme. There will be 120 questions in exam. The question will be of Multiple Choice Type questions. Subjects asked in exam are Physics, Chemistry, and Mathematics. Total duration of exam will be 2 hours. The AP Polycet question paper will be prepared on the basis of AP POLYCET Syllabus which will include syllabus of SSC/10th class of AP board. Applicants can read SSC syllabus to get good score in Andhra Pradesh POLYCET 2018 exam. SBTET POLYCET question paper will include like Physics, Chemistry and Mathematics. After reaching on home page, move towards “Downloads” section that is available in right side of page. Under that, contenders can hit on “APPOLYCET-2018 Booklet” link. By pressing on it, AP POLYCET Notification 2018 will appear. Go through AP POLYCET Advertisement carefully and ensure your eligibility for Andhra Pradesh Polytechnic Common Entrance Test 2018. Now, eligible and registered candidates for SBTET POLYCET can go back to home page and press “Sign-in” tab that is available in menu bar. A page will appear which will look like below image. 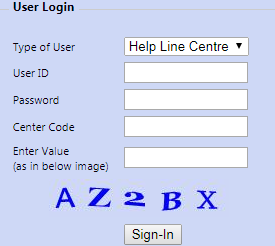 Candidates can fill the AP POLYCET Login details properly and then hit “sign-in” tab. Now, you can fill AP POLYCET Application Form with complete details in proper manner. Also, upload all necessary documents and certificates with AP POLYCET Online Application Form. Make the payment of fee through proper mode and recheck the details once. Finally you can hit submit tab and take the hard copy of AP POLYCET Online Form for future use. Appearing candidates may get their AP POLYCET Hall Ticket through official website of the organization. For getting the AP Polycet Admit Card applicants must have their roll number and other important details. The Andhra Pradesh POLYCET 2018 hall ticket will be published in third week of April 2018. No candidate will be permitted to enter the examination hall without call letter, so applicants must download it before the examination. After AP POLYCET exam is successfully organized, the authority of will publish the AP Polycet answer key. Applicant can analyze their marks and check their performance through answer key which will be available one/two week before the exam. Andhra Pradesh POLYCET 2018 Result will be released in the second week of May 2018. You can download their AP Polycet Results through official website of the organization. On the basis of result, a merit list will be published. Candidates whose name given in the merit list they will be selected. After the declaration of the AP Polycet Entrance Exam results, the information about counselling will be mentioned in the website. AP Polycet 2018 counselling will be started in the month of June/July. Applicants need to select the college and course in which they want to get admission at the time of counseling. The admission will be given as per the student’s preference and rank obtained in entrance exam. Applicants may visit Official Link for obtaining further details regarding AP Polycet 2018. Dear visitors keep in touch with this web portal for getting more information related to AP Polycet Joining Report. If you have any query you may leave a comment in a below mentioned comment box, we will solve your query as soon as possible. You may subscribe us on Google plus and Facebook for getting more information instantly on your wall.